Geotechnical Engineer - Geotechnical Specialties, Inc. The alignment for the proposed Oak Grove Connector roadway went through an old borrow pit lake. The sandy materials in the lake were in a loose condition, which created a potentially unstable situation as the roadway fill was raised and extended further into the lake. 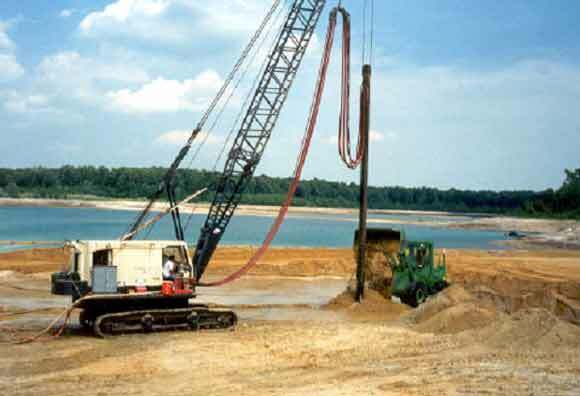 The geotechnical engineer recommended densification of the sands by vibrocompaction. TerraSystems performed the vibrocompaction with one of our down-hole vibrators. The specifications required a relative density of 70% in the densified layer. Static cone testing indicated relative densities much greater than 70% were obtained.